Retreat planning takes organization to ensure the event fills up and runs smoothly. From identifying a location, activities, and meal planning, as the “event planner” you have a lot of decisions to make. 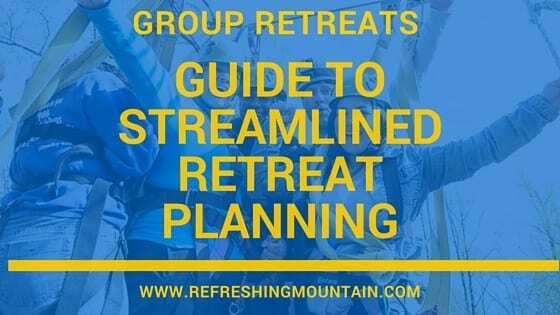 Refreshing Mountain aims to make the entire retreat planning process easier for you! Our years of experience from hosting successful group retreats have enabled us to create a unique and simplified process for ensuring a successful event. With checklists, promotional materials, and more, Refreshing Mountain streamlines every detail of planning a successful group event. Once you’ve decided to host a group retreat at Refreshing Mountain, our staff is dedicated to helping make the event a complete success. First, consult the step-by-step checklist for scheduling your event. Proper forms with due dates are all listed for your reference. Once you receive your contract, you can use our handy retreat planning form to help you and the staff determine the goals for your retreat and facilitate scheduling of activities. These tools ensure all the paperwork is in place and your event moves forward seamlessly. Group retreats are unique events, with each having its own needs and goals. When determining your activities, it can be helpful to consult a sample retreat schedule to see how a typical event is run. Included in this handy document is a list of questions you answer during the scheduling process. This will help you pinpoint the key decisions quickly so once your group arrives, everything will be ready to go! Refreshing Mountain offers a variety of activities appropriate for group retreats. To make your planning easy, options and prices are all available on the resources page for rapid reference. With these easy-to-read brochures, you will be able to choose the activities you want, and calculate the cost so you can stay on-budget! Equipment rentals are available for your convenience at affordable prices (including sound systems, golf carts, and projectors). Meal planning is a very important aspect of your retreat, so we have created a Menu Request Form to help you monitor the requirements. This info will alert the staff at Refreshing Mountain to any special meal requirements for your group. Special requests will be honored whenever possible. Cold storage, and a microwave are provided for group retreats whose participants need to bring supplemental food due to dietary restrictions. Also on the resources pages, you will be able to download special pre-made forms that make managing and organizing your retreat a breeze. These forms must be completed prior to all group retreats and includes the often overlooked PA Tax Exemption Form and a waiver to be filled out by each participant. The final numbers worksheet is handy form that will help you plan out room assignments and confirm your final group counts to our planning staff. To assist you in promoting your event, Refreshing Mountain has compiled a variety of custom promotional materials for your use including brochures, inserts, and posters! Promoting your retreat with these informative and attractive materials will help ensure a great turnout, making your retreat a success. We’ve even customized our retreat promotion templates with customs images so that you can use them for men’s retreats, women’s retreats, youth retreats or family retreats. Involved and prepared participants make for successful group retreats. Providing your guests with the helpful information will ensure that everyone is ready and excited for the event. With this handy retreat packing list, participants will know exactly what to bring – and what to leave at home. You can also access guidelines and pool rules (summer months) so everyone knows the boundaries in place during the retreat. While planning group retreats, it can be helpful to consult the Refreshing Mountain map and room layouts. These are included on the resources page for your planning convenience. From start to finish, Refreshing Mountain is committed to guiding you through the process of planning a retreat and having a successful event. Group retreats are an excellent way to connect and strengthen bonds. From “Where do I get started” to “What do I do next” Refreshing Mountain has you covered! With proven tools available in one place, planning is streamlined and easy for a stress-free and successful retreat. Still have questions about planning your retreat? We are here to help, contact us today!